So you guys remember Monday? When I showed you that super heathy salad full of colorful peppers, olives, lean chicken and watermelon? Yeah, well that salad was so I could show you these doughnuts today. Balance it the key to life, right? Salad for dinner, doughnuts for dessert. Sounds like the perfect balance to me. I have so much to say about these doughnuts it’s not even funny. Coconut, coffee, milk chocolate, more coffee and GRILLED. Oh yes, I grilled my doughnuts and I possibly discovered heaven on earth. Honestly, I am not exaggerating. Let me first just say that it is official. I am currently obsessed with coconut, corn, berries, salsa, guacamole and the grill. 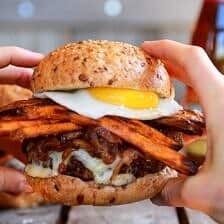 In the last couple weeks I have shown you Snickers Coconut Caramel Cupcakes, Corn Fritters with Coconut Whipped Cream and Sweet Honey Bourbon Syrup, Sweet Honey Jalapeño Cheddar Cornbread Biscuits, BBQ Grilled Corn, Jalapeño and Peach Quinoa Salad, Cheesy Cajun Fries with Grilled Corn Guacamole, Bacon and Fried Eggs, Brie Crab Cake Pretzel Slider Melts with Strawberry Pineapple Salsa, Hawaiian BBQ Quesadillas with Pineapple-Mango Guacamole. All of which contain one or more of the foods listed above, and most of them were grilled. This recipe however is a first. I have never grilled, nor even thought to grill, a bread/dessert/ anything sweet. Recently though, my brain is coming up with some crazy combinations, and some even crazier ways to cook things. Sometimes I truly believe I am going crazy. Example? Well let’s see, I have tons. Okay, here’s one. 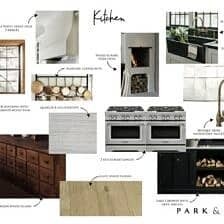 See the white small oval bowl in the photos? Well, I have two of those bowls and use them all the time. Last week I was using both of them. One for yet another fruit salsa that I made that you have yet to see and another for a sauce that again you have yet to see. Anyway, the bowl with the delicious fruit salsa in it went MIA (missing in action). A week later I still have no idea where that bowl is. All I can hope is that I did get rid of the salsa before it went missing, but I am thinking that I didn’t since It went missing during the photo shoot. And no one stole it or ate it because no one else was home last week. Just crazy me. I beginning to fear the day I do finally come across that bowl. Sometimes though my craziness leads to good things. Like grilled doughnuts. 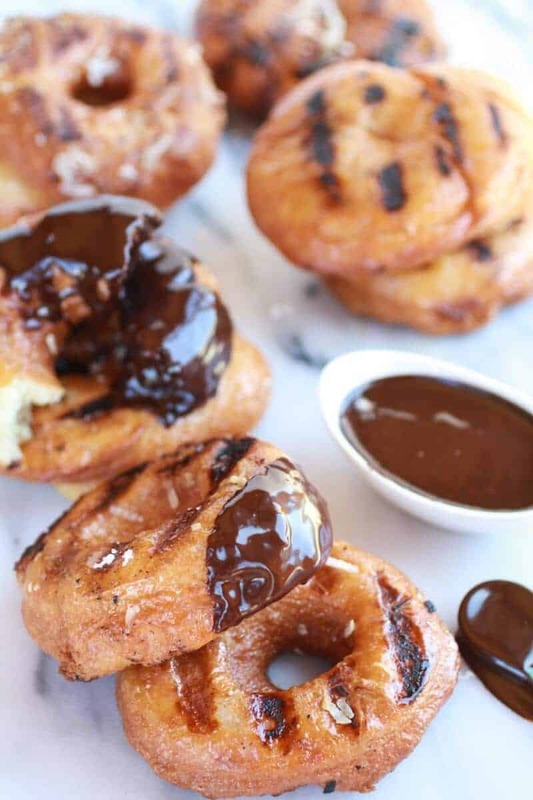 Oh yes, grilled doughnuts are definitely a good thing. Actually, I took the craziness to a whole new level this week and fried two more batches of doughnuts. Okay wait I don’t think that is craziness I think that is more indulgence, but whatever. The first batch I totally messed up, so a second batch had to be made. Expect another crazy doughnut recipe in the next few weeks, possibly even next week. I might not be able to hold my excitement over the second recipe too long. Trust me it’s a good one. Obviously, I went doughnut crazy. I promise, we do not eat like this everyday. We are normally healthy people, really we are…. Here’s the deal. You start with a pretty basic doughnut recipe except I swapped in coconut milk for the milk (if you prefer you can use regular milk). 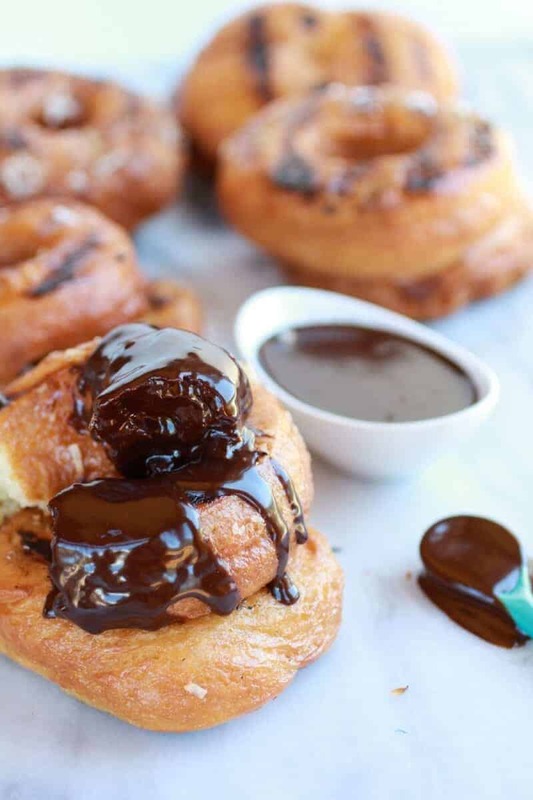 Then you cover the doughnut in an espresso glaze that is basically like dipping your doughnut in one of the Starbucks coconut frappuccino drinks that the world loves so much. Ah huh, that’s right, these are freaking amazing. But you know me, I like to do things over the top. Especially on Friday. Fridays have always been my very favorite day and they deserve over the top goodness. 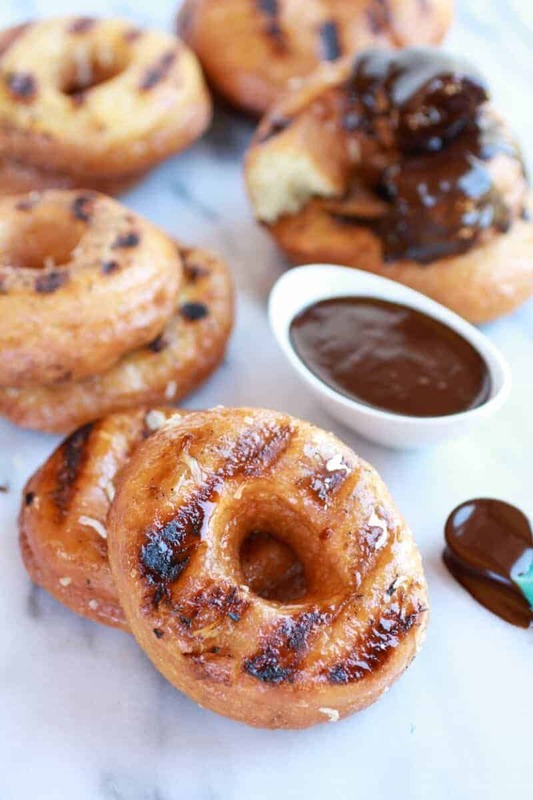 Once you glaze the doughnuts then it’s time to grill them! Really, don’t be scared of the doing this. It is the easiest thing ever and takes no longer than a minute. Yeah a minute, and watch those things like a hawk, trust me, I charred a few. The sugars from the glaze caramelize and create the best tasting thing around. I mean it’s caramelized-coffee-coconut sugar! 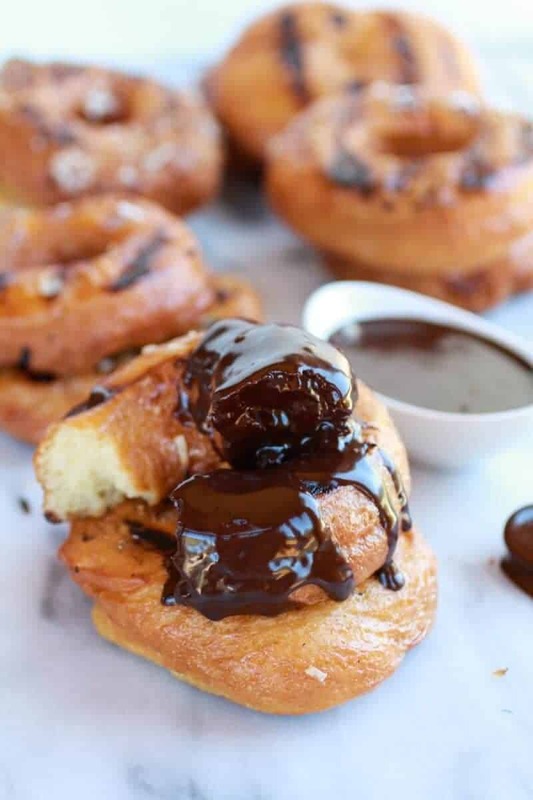 Oh wait, before you grill the donuts you need to make the Mocha Coconut Ganache Dipping Sauce. Yes you do, I mean the name says it all. It’s Mocha Coconut, enough said. If you are really not feeling up to making and frying the doughnuts at least just go buy some doughnuts at the store. 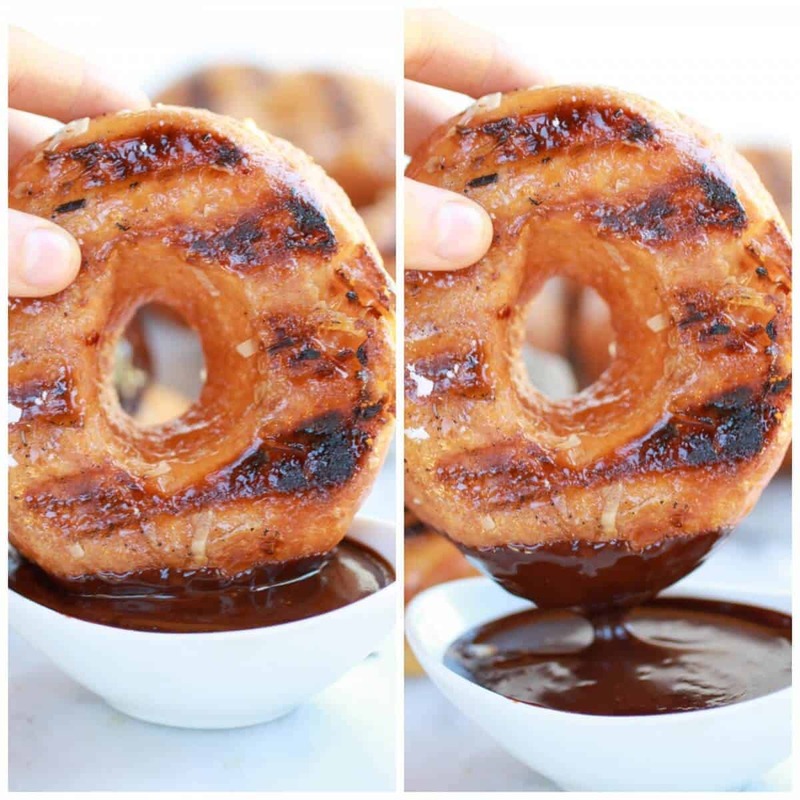 Cover them in the espresso glaze and then grill and dip into them into the Mocha coconut sauce. Hot caramelized doughnuts, ready in fifteen minutes. Now you have no excuse. Making these doughnuts is mandatory. Really, don't be scared of the doing this. It is the easiest thing ever and takes no longer than a minute. Yeah a minute, and watch those things like a hawk, trust me, I charred a few. The sugars from the glaze caramelize and create the best tasting thing around. I mean it's caramelized-coffee-coconut sugar! In the bowl of your electric mixer (with the dough hook attached) add the sugar to the coconut milk, stir to dissolve and add the yeast. Stir gently, then let sit for 10 minutes. Melt the butter in a separate bowl, add the beaten eggs, stirring constantly to make sure the butter is not too hot for the eggs. Add the egg/butter mixture to the yeast mixture. With the mixer on medium-low speed, allow the dough hook to stir this mixture for a couple of minutes, making sure it's thoroughly combined. With the mixer still going, add the salt and flour in 1/2 cup increments until all the flour is gone. Stop the mixer, scrape the bowl, then turn the mixer on the same speed again for five minutes. After five minutes, stop the mixer and scrape the bottom of the bowl. Transfer the dough to a lightly oiled bowl and toss the dough to coat, then cover the bowl with plastic wrap and place straight in the fridge. 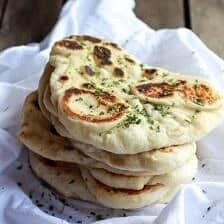 Refrigerate dough for at least 8 hours, or overnight. Remove bowl from fridge and turn out dough onto a lightly floured surface. Roll out to 1/4 to 1/3-inch thickness. Using a 3-inch cutter, cut as many rounds as you can, then roll out remaining dough and cut as much as you can. Place the doughnuts on a floured baking sheet and use a 1 inch cutter to cut out the the middle of the doughnuts. Cover with large towel and place in a warm place in your kitchen. Allow doughnuts to rise for one hour (mine were good to go after 50 minutes). 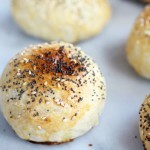 Doughuts should be puffy and airy. Make the Espresso Glaze by combining the coconut water, powdered sugar and coffee in a medium size bowl. Whisk to combine and set aside while you fry the doughnuts. Heat a few inches of oil over medium-high heat in a large saucepan. Once the oil reaches 350 degrees F, add the doughnuts 2-3 at a time and fry until golden brown, about 2-3 minutes per side. Make sure you are using a thermometer and do not allow your oil to get too hot! The doughnuts need about 4-5 full minutes in the oil so the insides cook, and if it's too hot the dough will burn (trust me, I have burned my fair share of doughnuts). After frying, transfer each doughnut to a paper towel to let the excess oil drain. 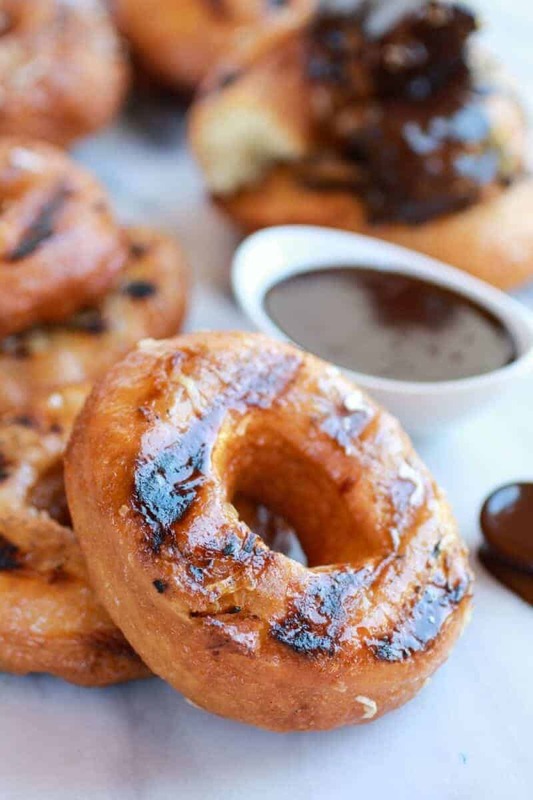 Dunk each doughnut throughly in the espresso glaze (really coat it well, the glaze helps the doughnut get caramelized and delicious on the grill) and then sprinkle each doughnut with the shredded coconut. Place on a wire rack and allow the excess glaze to drip off. Store in an airtight container until ready to grill. Don't wait more than a day, doughnuts are the very best the minute you fry them. When ready preheat the grill to medium. While the grill preheats comine the milk chocolate and coconut milk in a small sauce pan. Heat over low heat until the chocolate has melted. Whisk the espresso powder into the hot melted chocolate until fully dissolved and smooth. Stir in the vanilla. You may also melt the chocolate in the microwave on 30 second intervals, stirring between each. Coat doughnuts with cooking spray (I actually forgot to do this, but I think it would have been helpful). Grill doughnuts, covered, until lightly browned, 30 seconds to 1 minute per side. Watch closely, I burned WAY too many of mine. 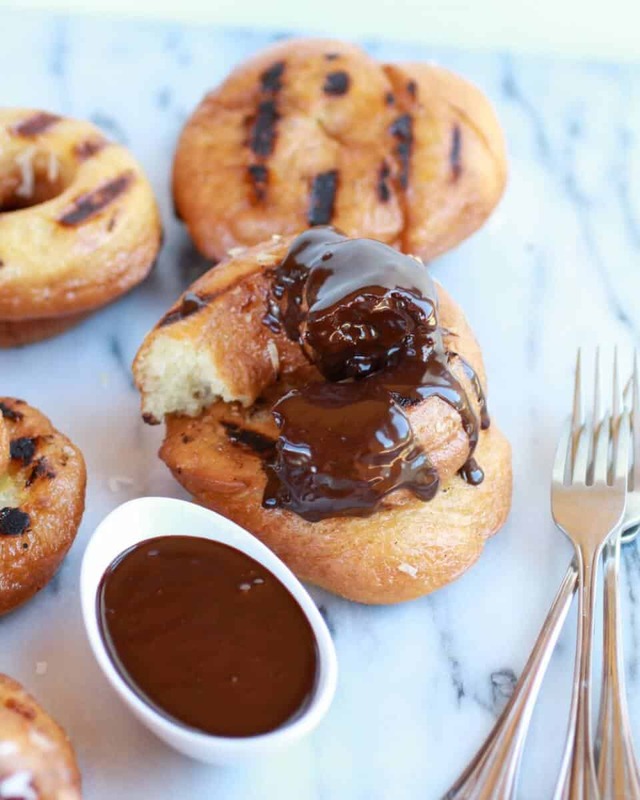 Serve grilled doughnuts with the warm Mocha Coconut Ganache Dipping Sauce. Devour! 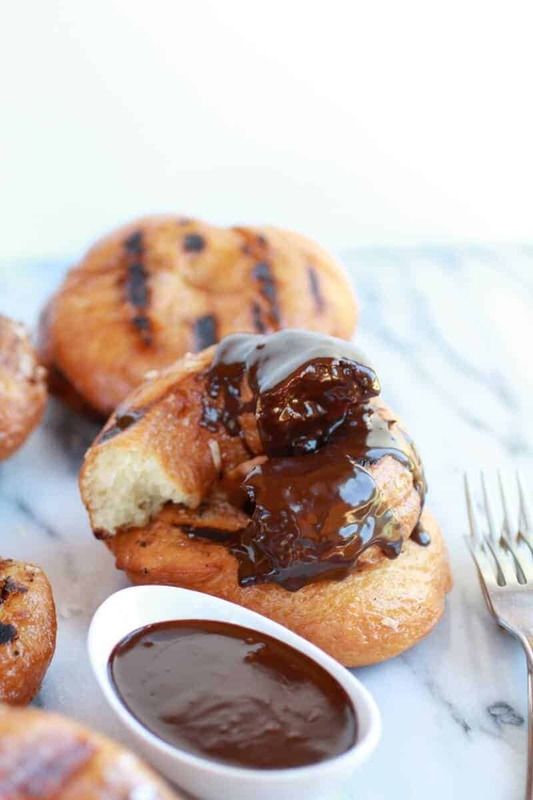 Hip, hip hooray for Friday….and hot caramelized grilled doughnuts! Oh, my, that could get us into trouble, calorie wise. Hahaha!! Ah yes, it could! It’s worth it though! That’s incredible! 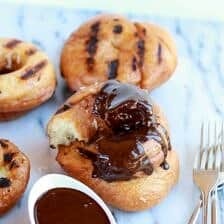 Frying then grilling doughnuts? So my kind of crazy!!! And then you made this coffee themed…hello overindulgence!:). Thanks so much for this recipe, I really hope I can try it after I get back to my own kitchen! Thank you, Mary! I really hope you do try these and love them! Grill marks. The glaze. Coconut milk. Espresso. WOW!! Your brain works in beautiful ways. Pinned! Thank you and thanks for pinning Averie! Craziness definitely leads to good things! 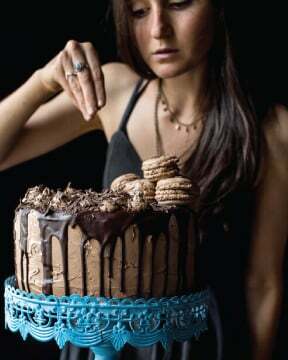 Love the idea of a mocha coconut ganache, yum. OHMYGOD these look chuffing amazing!!! 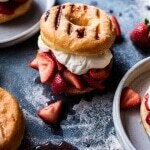 You’re not crazy, you’re a genius, I’ve never thought of grilling doughnuts before!! And I know what you meant about stuff going walkabouts, it’s so annoying! I can turn the house upside down even though I thought I knew where it was and not find it ARGHHHH! Ha! Glad I am not alone! Thanks Annie! This will make one very impressive delicious dessert the next time we bbq! No one will expect such a finale to dinner. 🙂 The only grilled dessert I have ever suggested was s’mores. 🙂 You definitely packed all the necessary flavors for success into this one! Thank you so much, Wendy! Hope you and whoever you are feeding love these! Oh my God! This sounds heavenly. I’m thinking of suggesting it to my son for wedding cake material!! Thank you Tieghan. Ah! Yes, What a cool idea! Hope it goes over well! 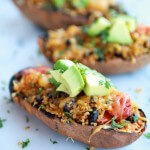 You nailed this one – these look amazing! 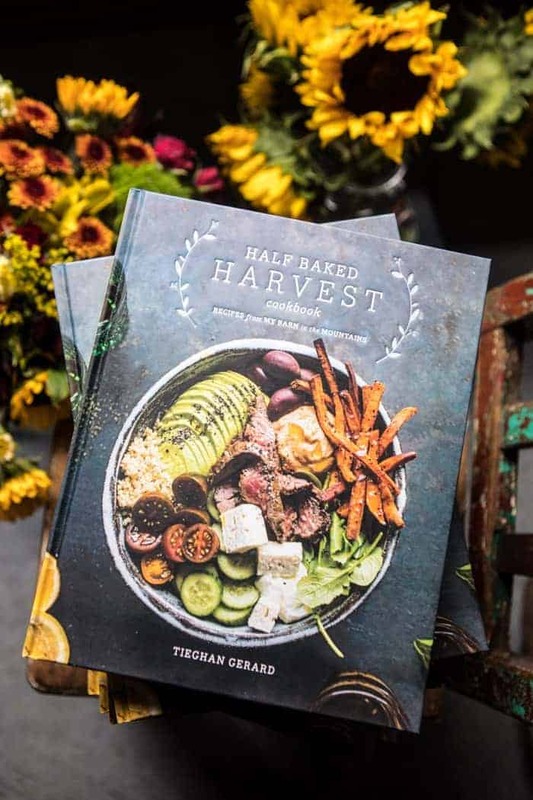 What a nice balance to your earlier salad post! Thanks for these!! A grilled donut! I have to show these to my husband. Ha! Hope you guys give them a try! Oh geez, these will be the death of me. Donuts=major weakness!! Plus grilling them?? Sheer brilliance my friend. 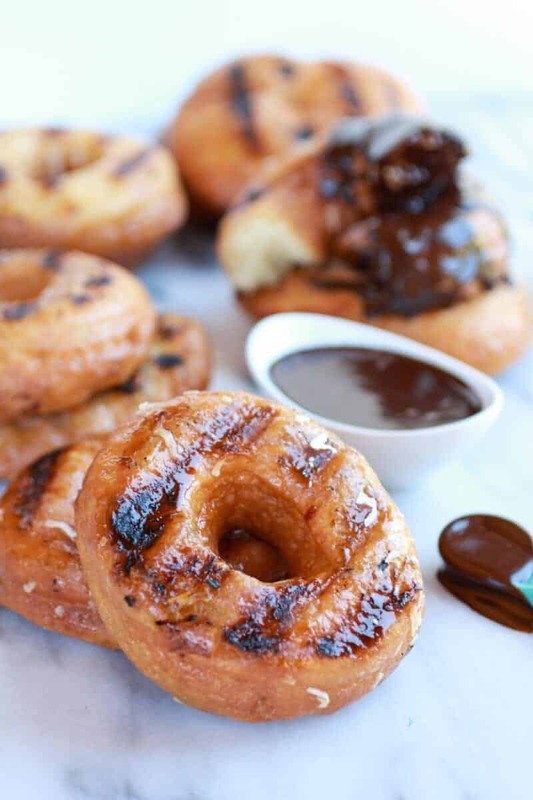 Tieghan, your doughnuts look so light and lovely, and I am a sucker for that caramel flavor that comes from grilling. So yummy! So I just had to wipe the drool off my mouth! 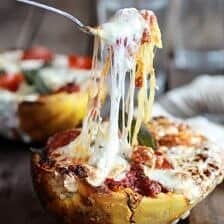 Holy cow these look amazing!! PINNED!! Girrrrrrl where do you come up with these cray cray combinations!? You’re so creative! I’m always amazed when I look at your blog. Your recipes amaze me! Wow! Thank you so much, Kristi! That mocha coconut ganache. OMG. Are you serious with that? Tieghan, I just died and went to heaven. These donuts look insanely good!! Love all of the flavors together. Coffee/mocha/espresso! And paired with coconut. Amazing! I know I tell you think all the time but your creativity astounds me!! Grilling doughnuts!!!! That is ingenious…like serious groundbreaking stuff! HA! I agree! Thanks Kylie! I just love how your mind works, you are a genius 🙂 I can’t wait to see the neighbor’s faces when they see me outside grilling doughnuts!!! Haha! Let me know how it goes! Thanks Lisa! These sound absolutely amazing! All those flavors together sound divine, and that ganache looks like the perfect addition to the donuts!!!! These look entirely bad for you. High in fat, high in calories, no redeeming qualities what-so-ever. (Which just makes me want them all the MORE!!!!!!!) YUM!!!!!! Ha! Thanks… I think! LOL! It was definitely a compliment. Who doesn’t enjoy eating all the goodies that are esp. bad for you? I sure do. It makes me feel so naughty! 😉 I don’t think I could even bear to share these! Is that selfish? LOL! Haha! Well thank you, Donna! 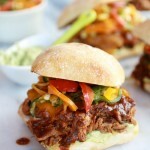 Saw the photo on seriouseats and had to come over to check out the creative genius behind these!! What a brilliant idea. I love these. Haha! Thank you!! I thought they were pretty genius too, plus SO incredible! I’m pretty sure these are yeast donuts, but I just wanted to double check, yeast or cake? Yup, yeast. Hope you love them!